Almost everyone has heard of Whey Protein but what about Casein? 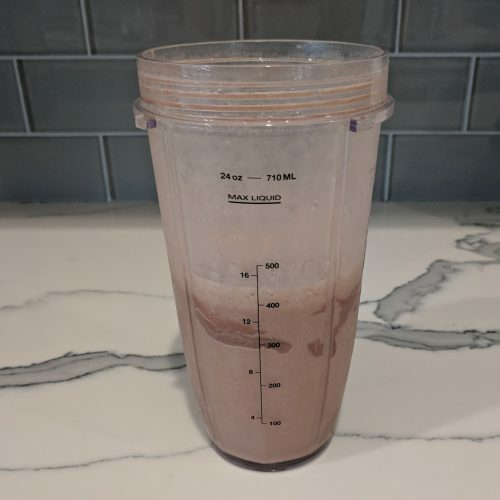 This chocolate casein protein shake is easy to make, delicious and the perfect night time snack! Casein protein is broken down and digested by the body more slowly than Whey protein. In my opinion this makes casein the perfect night time snack or ideal for when you have no clue when your next meal will be (hello, long morning meetings!). Because Casein digests slower, this helps you to feel fuller longer! Whereas, Whey is digested and absorbed quickly so it gives you that POW of energy! 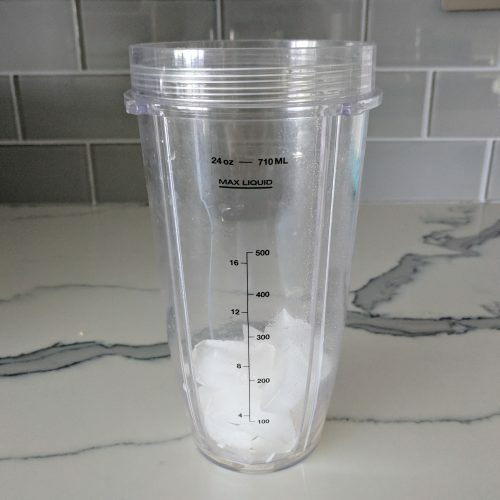 (click here for my Whey Protein shake recipe). SHAKE SHAKE SHAKE SHAKE SHAKE SHIGGY SHAKE SHAKE!! 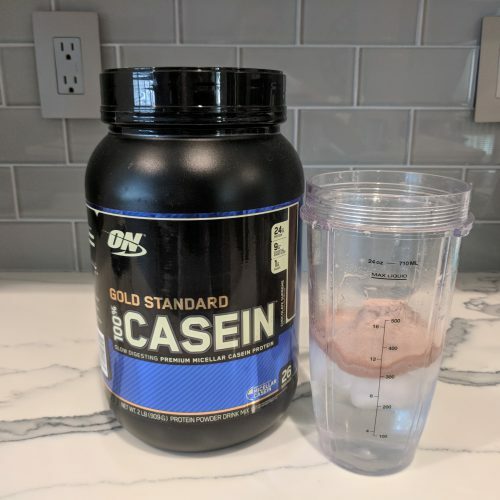 This chocolate casein shake is the perfect night time snack. It satiates my chocolate craving and helps me steer clear from other unhealthy night time snacks. It is packed with slow digesting protein so it keeps me full all night long so that I don’t wake up ravaging with hunger. If I still went into the office and had those long morning meetings this would also be the perfect opportunity to make a casein protein shake. It will keep you satiated, which in turn makes you more productive and pleasant to be around. 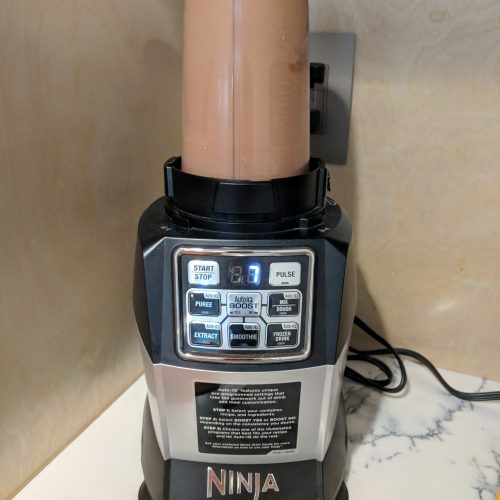 You can stir this shake manually BUT I prefer to use my beloved Ninja Blender (click here to buy on Amazon). 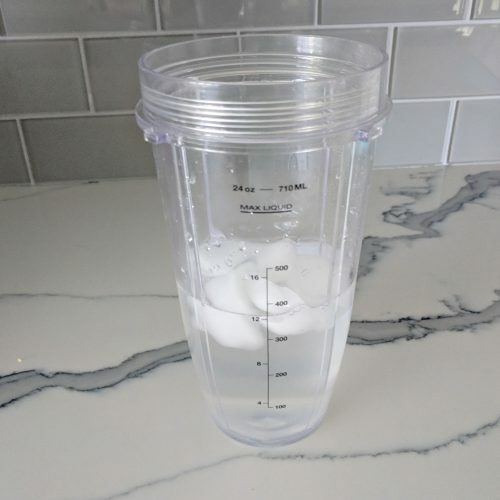 This blender comes with individual shake cups so you can easily make a single serving and then drink it right out of the cup! So convenient and easy and you don’t get chunks of protein in your mouth (because who wants that?!). 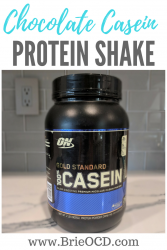 I buy this Chocolate Casein Protein on Amazon! (Click here to buy). The chocolate is my favorite flavor and the 2# canister lasts a while because I only use one scoop a day. Watch my YouTube video below (or click here!) to see what other supplemental protein I buy and use! add one scoop of Casein protein. stir well OR use the Ninja to mix it for about 20 seconds.